This page gathers general information on turbofans. Our proposed design is scattered in several pages, with an index at the bottom of this page. 1 How to build a cheap (~ $150) turbofan? 1.2.1 Shaped core or shaped shaft? How to build a cheap (~ $150) turbofan? Turbofans are the most efficient engine design for subsonic speeds cruising. They are more powerful and way lighter than reciprocating engines, fly at higher speeds than turbopropellers, and are less fuel-greedy than supersonic-enabled turbojets or other engines. They are however very difficult to design and manufacture and are thus very expensive. On this page, we will explore how costs can be reduced while still having adequate capabilities for high altitude flight. A lot of information is available on Wikipedia's turbofan page. General principle is that there is a combustion that puts energy into a gas, this energy is extracted by a turbine, and the turbine drives both the fan that provides thrust and the compression stage that feeds the combustion with oxygen. As air is compressed from the intake, more air becomes available for combustion, and thus create more work on the turbine, and more intake, and so on. The fan provides thrust by creating a massive air flow, and the engine's core also creates thrust by evacuating the high-speed hot combustion gas. In commercial turbofan engines, the fan is generally responsible for 90% of the overall thrust. The Bypass ratio (BPR) is a ratio between the mass flow rate of air drawn in by the fan but bypassing the engine core to the mass flow rate passing through the engine core. An engine with a BPR = 0 would be a turbojet engine. The higher BPR, the more efficient the engine, but also the slower exhaust speed. The number of spools: modern engines embed a second and sometimes a third concentric shaft for high pressure operations. The low pressure shaft, the innermost, has the fan mounted on it. One-stage engines exist and are less complicated and expensive to build, but are much less efficient. Indeed, higher rotation speeds in the internal spools allow to provide a more efficient compression. A gearbox may be needed to drive the fan if the shaft has a too important rotation speed in the case of a single-spooled turbofan, but this is not an easy task due to its very speed. Commercial engines featuring a gearbox for the turbofan's fan (geared turbofans) have reached market in the past few years. Multi-spooled engines lessen this issue, by keeping the low-pressure stages at relatively low speeds, suited for the fan. High-speed fans are complicated to understand and design, and undergo higher losses due to transonic regime, and having a gearbox on a twin-spool engine is even better, to get a high efficiency turbine and a slowly rotating fan. The compression ratio is the ratio of the pressure of intake air on compressor discharge air. It is closely determined by the number of stages in the compressor and their efficiency. More compression means more air to blend with fuel and to cool the engine, and even more pressure at output, increasing the speed and mass of output gas and thus the work that can be extracted by the turbines. The turbine inlet temperature is the key parameter for turbine engine. Attaining higher temperatures after combustion, in the turbine inlet, makes an engine more efficient, as explained by the Brayton thermodynamic cycle. The obvious issue is the temperature that materials can withstand, in particular the first turbine guide vane and the first high-pressure turbine blades. High-temperature alloys and special cooling techniques, like film cooling using some compressor bleed air, have to be employed. A must-read book by Klaus Hünecke: Jet engines: fundamentals of theory, design, and operation. Video documentaries from a turbine renovator in Canada, probably the best resource on the Web for seeing what's inside real engines: AgentJayZ on youtube. Huge thanks to you! Design configurations and properties taken into concern on real engines aim to increase efficiency, reduce noise, life time. Cost is of course a concern, and an efficiency by itself, but not the primary constraint as it is for us. Safety of operation is their primary concern, whereas cost and ease of maintenance are our primary concerns -- and maintenance will be an important part of the job if the quality goes down with the cost. Shaped core or shaped shaft? An obvious but important optimization to reduce cost and complexity of manufacturing is to have a simpler design of the parts creating the gas volume of the engine's core, i.e. the rotor(s) and the stator. In the above schema, we see that the shaft is straight and that the core envelope is curved suit required volume on each stage, although in real life, both are curved. If we take the required volumes on each stage and that we fix the core's envelope shape to a cylinder, the shaft will have a bumped profile (small-large-small diameter). This is much less expensive to design and produce, with a simple lathe (turning). Earlier engines, like the J79, have a cylindrical envelope. A curved envelope is complicated to build, requiring welding, pressing, stage bolting, the same techniques used in stator-construction in modern engines. These also do not scale down very well. Real-world engines don't have a massive turned shaft because of the weight. They consist of plates, for each compressor and turbine stage, that are linked together to the next stage using a cylindrical bolted joint. So basically, the shaft has no core, it's hollow, except for the plates on each stage. 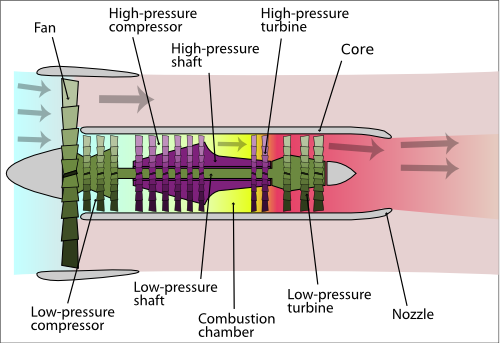 A big advantage of that is that the shaft can pass compressor bleed air to the turbines to use it as coolant. Our small engine design allows us to have a more simple design, since having a shaft turned in raw metal won't change much on its final mass. Moreover, we may use a turbine-level mechanism embedded in the stator to try to cool it, which would make it hollow. The main mechanical issues are probably how to properly fix the blades on rotor and stator with such a small scale and how to fix the rotor on the stator with little gap? The most complicated parts to build in a turbofan or turbojet engine are the turbine and compressor blades. The high-pressure turbine specifically have to face very high temperature and pressure. On real engines, they are made of ceramic-coated nickel-based superalloys. It's the inability of blades to withstand heat and work that limit the power of the engine. 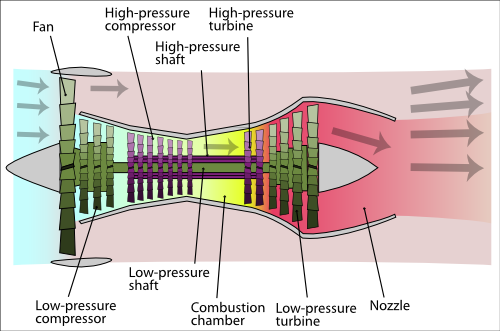 Indeed, around 70% of the gas provided by the compressor is used only for chamber and turbine cooling, instead of using it to burn more fuel and creating more thrust. The compressor and the turbine are not only made of blades on the rotor, but also blades on the stator, also called vanes. They prevent a rotating air flow driven by the action of rotor blades to form inside the engine, which would not allow pressure to be built on the gas at each stage. Stator blades or vanes redirect the airflow on the next stage in the more efficient direction (see velocity triangle). Highest efficiencies are reached in turbofans when gaps are reduced between rotor blades' tip and the stator, as well as between the stator blades' tip and the rotor. As always, good efficiency means high precision and higher cost. Anyway, the precision of blades will have to be very good if we don't want it to dislocate when it reaches the high rotations-per-minute achieved by such engines. The shape of the blades and the parameters of their cascade also affects the efficiency, and in particular the pressure ratios. A small 5 stage supersonic compressor providing the same pressure rise than a 15 stage subsonic compressor is less efficient, but it may be compensated by the higher thrust-to-weight ratio. Blade geometric design is also very complicated. First turbine engines had flat blades. At the time, the efficiency of the engine was so terrible that it was believed that turbojets would never beat reciprocating engines. Then, in 1926, Alan A. Griffith proved that if blades were designed as aerofoils (airfoils in US English), the engine would behave way better, and would even be efficient enough to deserve being built. Airfoils for blade designs allow compressor stages to better increase the static pressure since they create an expander, an increasing area for the air flow to pass through. Cooling is always needed in turbines, even if recent advances in materials and coatings increased the ability of blades to withstand heat. Since we will use low cost metals, cooling will be the main issue once we figured out how to build the engine. Expected combustion chamber temperature is around 2000°C for hydrocarbon or alcohol fuels. Iron melting point is around 1500°C so it will be way off-limits, and even below that, it will deform before melting. And should we mention that blade deformation at high-centrifugal loads, caused by the high rpm, is a very good way to blow the engine off? Several cooling ways are used in a turbofan/turbojet engine: in the combustion chambers, only a small amount of the actual air flow is used for the combustion, around 20%. The rest is injected on the walls of the chamber and in the end of the combustion to dilute the hot gas, and to prevent the walls from melting (film cooling). Then, the first object struck by this hot gas is the vanes the turbine, which are, on actual engines, made of a ceramic-coated high-temperature alloy, but more importantly, hollow. Blades are welded on the stator ring, around which air from the compressor discharge or bleed circulates, enters the blades, and evacuates through small holes in the blades (convective cooling and film cooling). For the rotor blades, the same principle is used, but with compressor air passing inside the rotor. Start-up can be done at ground manually, with compressed air or a high speed electric engine for example, which will allow weight and complexity of the engine to be reduced. On the other side, a turbine engine is a nice way of having power on-board, using reducing gears and an alternator. That would also reduce the weight required for batteries, since the alternator would be used reversely as a start-up DC motor. Also, the accessories attached to the reduced shaft would allow hydraulic or pneumatic power to be considered. Our main issue for such turbine accessories with a very small engine would be to find the actual space in it where they could fit, especially with a cheap and efficient approach. Igniter mechanisms must be integrated to the engine, possibly a self-maintaining igniter like a thread of tungsten, as used in miniature R/C engines. The combustion should be self-maintaining under normal circumstances, but if pump or throttle malfunctions, or if there is a disruption in the intake airflow leading to compressor stall, re-ignition would have to be made during the flight. Free restart of a turbofan is possible if the airspeed is sufficient to make it rotate at the start-up angular velocity, but in other cases that would require an embedded start-up motor or compressed air input. On airliners, bleed air from another engine can be used, but with such tightly constrained motors, we would have a hard time enabling that. Engine must be designed with sensors, at least to determine if the engine is running properly or if it's under failure, and to control its fuel flow rate based on rotation speed, environmental conditions (pressure and temperature) and others. A rotation sensor could a good start, measuring the magnetic field disturbances created by the blades or the rotor. Engine temperature should be controlled and recorded too, probably using a thermocouple. Pressure at different stages would be very useful for engine development and operating, but is also a quality source for failure detection. The rotor speed information and altimeter may be redundant with some of the pressure information. A NASA GN&C webcast on the Fundamentals of Aircraft Engine Control presents control design, sensors used, and operational safety for turbofan engines (direct link). In real engines, blades are fixed like this, with a dovetail or fir-tree shape that allow them to be mounted and removed axially but not orthogonally. The main problem appearing with this kind of mount is related to the size of the engines we aim. As the diameter of the fan shaft gets smaller, the available space for the blade roots gets smaller, and require a higher precision for their manufacturing. See this example of small fan, from Price Induction. The strength applying to the fixation is luckily reduced due to the small weight of the blades. A simpler design in blade root would be nice for manufacturing ease, a simple square-section root is probably enough. Another lead is to create the blade disk and the blades in a single piece. This can be done with modern manufacturing process like electric discharge machining, 5-dof machining or even laser-based 3D printing. Here is an example from Bladon Jets, the BLISK. This is a major issue. On real-size engines, the stator is thick enough to have a rail into which the perpendicular-to-the-blade-roots are inserted and fixed. Creating a perpendicular blade root is already a challenge. Rotor blades would be able to compensate this problem by having longer roots with a locking mechanism on their side, but for the stator, the limited thickness of the stator's wall forbids it. Maybe bolting should be considered. In that case, the screw heads would likely surpass the core's envelope and lightly disturb the fan flow. Fuel tanks in the wings, fuel pumps, fuel lines, and engine mounting will have to be designed too. Electrical wires for pumps, sensors, ignition and possibly the startup motor/alternator will also be required. Sensors will require input ports on the computer, and pump driving (= engine control loop) will require at least one output port for each engine on the computer. Two kinds of bearings are used in turbines. Ball bearing: stator and rotor are joint using a ball bearing constantly bathed in oil to survive to high speeds/temperature. Fluid bearing: pressurized oil prevents parts from touching, due to hydrostatic. Longer life and no maintenance, but harder to build and to operate. Carbon or composite lip or blade seals prevent the oil from escaping to other parts of the engine. They may be arranged as labyrinth seals to increase their effect. Air bled from the compressor discharge is often used to counteract the oil pressure on the seals. Compressor: A three to five stage compressor, with a design allowing easy manufacturing. Blades: How to design an cheaply manufacture compressor, turbine and fan blades. Combustors: Combustors are the power input of the engine, and need not to melt while sustaining the combustion. Bearings and cooling: high speed rotations require adapted bearings and cooling, which may be reused for rotor and even turbine cooling. This page was last modified on 20 January 2015, at 03:44.